Why Contribute to Atlanta Lyric Theatre? Atlanta Lyric The­atre is ded­i­cat­ed to pro­duc­ing the best in musi­cal the­atre and fos­ter­ing the growth of the Atlanta the­atri­cal com­mu­ni­ty by ignit­ing our pas­sion in our audi­ences and artists. Through edu­ca­tion­al pro­grams and pur­suit of artis­tic excel­lence, The Lyric cre­ates and encour­ages work which uplifts, enlight­ens and enter­tains. The sup­port of donors like you is reflect­ed in more places than just on our stage. Dona­tions like yours also allow the Lyric to con­tin­ue to grow our youth edu­ca­tion pro­grams such as Lyric Jr., our brand new Young Artists pro­gram for teens and our excit­ing part­ner­ship with Ken­ne­saw State Uni­ver­si­ty-which gives the­atre majors the oppor­tu­ni­ty to be a part of pro­fes­sion­al the­atre. All this to say, your dona­tion makes an enor­mous dif­fer­ence. A dona­tion of $50 can cov­er the cost of all the nuts and bolts required for an entire pro­duc­tion. A dona­tion of $100 cov­ers the cost of posters for a Lyric show, help­ing us to spread the word through­out the com­mu­ni­ty. A gift of $500 can cov­er the par­tic­i­pa­tion of one KSU stu­dent intern in a pro­fes­sion­al Lyric pro­duc­tion. A dona­tion of $1,000 can under­write a por­tion of the scenic design, cos­tume design or cast stipends for a Lyric show. Gifts of $10,000 or more can be trans­for­ma­tive. It can sup­ple­ment the salaries of our incred­i­ble live orches­tra, defray rental costs, licens­ing fees, and open up a world of oppor­tu­ni­ty to expand pro­gram­ming and make pro­duc­tions more robust. 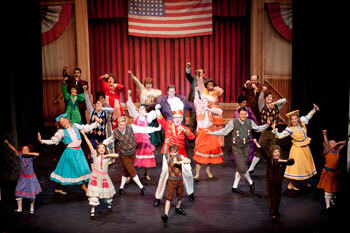 Atlanta Lyric The­atre is a 501(c)(3) non­prof­it orga­ni­za­tion and all dona­tions are tax-deductible. Please donate today by click­ing here, or con­tact Mary Nye Ben­net at mbennett@atlantalyrictheatre.com or (404) 377‑9948.